The Bachelor of Business Administration with Honours in Business Intelligence and Analytics is a 4-year degree programme. Applicants can apply for admission to Year 1 or Senior Year. This programme is intended for students who wish to pursue careers in, for example, data management, business intelligence, data analysis and business analysis. It aims to equip students with theoretical and practical knowledge and skills in data warehousing, big data management, business intelligence, and business analytics technologies and techniques that are needed for enterprises to capitalize on all data resources and make better business decisions. Graduates can seek employment in various for profit and not-for profit organizations as entry level professionals and managers. Opportunities are available for the graduates of this programme to pursue postgraduate studies in Hong Kong and abroad. Students may continue to study for a Master of Business Administration or other master degrees in business-related areas. 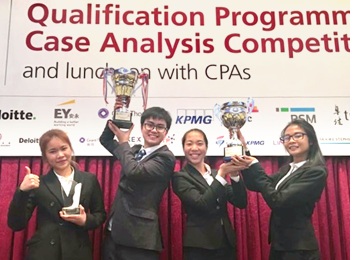 A team of four OUHK Business students participated in the HKICPA QP Case Analysis Competition. Among 300 teams, the OUHK team was awarded the Championship and one of the students was selected as the Best Presenter.